AA�calorimeterA�is an object used forA�calorimetry, or the process of measuring the heat ofA�chemical reactionsA�orA�physical changesA�as well asA�heat capacity. Differential scanning calorimeters, isothermal microcalorimeters, titration calorimeters and accelerated rate calorimeters are among the most common types. A simple calorimeter just consists of a thermometer attached to a metal container full of water suspended above a combustion chamber. To find theA�enthalpyA�change perA�moleA�of a substance A in a reaction between two substances A and B, the substances are added to a calorimeter and the initial and finalA�temperaturesA�(before the reaction started and after it has finished) are noted. Multiplying the temperature change by the mass andA�specific heat capacitiesA�of the substances gives a value for theA�energyA�given off or absorbed during the reaction. Dividing the energy change by how many moles of A were present gives its enthalpy change of reaction. This method is used primarily in academic teaching as it describes the theory of calorimetry. It does not account for the heat loss through the container or the heat capacity of the thermometer and container itself. 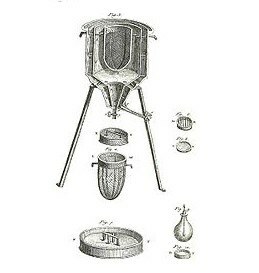 In 1780,A�Antoine LavoisierA�used aA�guinea pigA�in his experiments with the calorimeter, a device used to measure heat production. The heat from the guinea pig’s respiration melted snow surrounding the calorimeter, showing that respiratory gas exchange is a combustion, similar to a candle burning. AnA�adiabaticA�calorimeter is a calorimeter used to examine a runaway reaction. Since the calorimeter runs in an adiabatic environment, any heat generated by the material sample under test causes the sample to increase in temperature, thus fuelling the reaction. No adiabatic calorimeter is fully adiabatic – some heat will be lost by the sample to the sample holder. A mathematical correction factor, known as the phi-factor, can be used to adjust the calorimetric result to account for these heat losses. The phi-factor is the ratio of theA�thermal massA�of the sample and sample holder to the thermal mass of the sample alone. In more recent calorimeter designs, the whole bomb, pressurized with excess pure oxygen (typically at 30atm) and containing a weighed mass of a sample (typically 1-1.5 g) and a small fixed amount of water (to saturate the internal atmosphere, thus ensuring that all water produced is liquid, and removing the need to include enthalpy of vaporization in calculations), is submerged under a known volume of water (ca.A�2000 ml) before the charge is electrically ignited. The bomb, with the known mass of the sample and oxygen, form a closed system – no gases escape during the reaction. The weighted reactant put inside the steel container is then ignited. Energy is released by the combustion and heat flow from this crosses the stainless steel wall, thus raising the temperature of the steel bomb, its contents, and the surrounding water jacket. The temperature change in the water is then accurately measured with a thermometer. This reading, along with a bomb factor (which is dependent on the heat capacity of the metal bomb parts), is used to calculate the energy given out by the sample burn. A small correction is made to account for the electrical energy input, the burning fuse, and acid production (by titration of the residual liquid). After the temperature rise has been measured, the excess pressure in the bomb is released. Common compounds areA�benzoic acidA�(HcA�= 6318 cal/g) or p-methyl benzoic acid (HcA�= 6957 cal/g). The detection is based on a three-dimensional fluxmeter sensor. The fluxmeter element consists of a ring of several thermocouples in series. The corresponding thermopile of high thermal conductivity surrounds the experimental space within the calorimetric block. The radial arrangement of the thermopiles guarantees an almost complete integration of the heat. This is verified by the calculation of the efficiency ratio that indicates that an average value of 94% +/- 1% of heat is transmitted through the sensor on the full range of temperature of the Calvet-type calorimeter. In this setup, the sensitivity of the calorimeter is not affected by the crucible, the type of purgegas, or the flow rate. The main advantage of the setup is the increase of the experimental vessel’s size and consequently the size of the sample, without affecting the accuracy of the calorimetric measurement. AA�constant-pressure calorimeterA�measures the change inA�enthalpyA�of a reaction occurring inA�solutionA�during which theA�atmospheric pressureA�remains constant. In aA�differential scanning calorimeterA�(DSC),A�heat flowA�into a samplea��usually contained in a smallA�aluminiumA�capsule or ‘pan’a��is measured differentially, i.e., by comparing it to the flow into an empty reference pan. In aA�heat fluxA�DSC, both pans sit on a small slab of material with a known (calibrated) heat resistance K. The temperature of the calorimeter is raised linearly with time (scanned), i.e., the heating rate dT/dt = I? is kept constant. This time linearity requires good design and good (computerized) temperature control. Of course, controlled cooling and isothermal experiments are also possible. Note that this formula (equivalent toA�Newton’s law of heat flow) is analogous to, and much older than,A�Ohm’s lawA�of electric flow: I�V = R dQ/dt = R I. From theA�integralA�of this peak the enthalpy of melting can be determined, and from its onset the melting temperature. Differential scanning calorimetry is a workhorse technique in many fields, particularly inA�polymerA�characterization. AA�modulated temperature differential scanning calorimeterA�(MTDSC) is a type of DSC in which a small oscillation is imposed upon the otherwise linear heating rate. Safety Screening:- DSC may also be used as an initial safety screening tool. In this mode the sample will be housed in a non-reactive crucible (oftenA�Gold, or Gold plated steel), and which will be able to withstandA�pressureA�(typically up to 100A�bar). The presence of anA�exothermicA�event can then be used to assess theA�stabilityA�of a substance to heat. However, due to a combination of relatively poor sensitivity, slower than normal scan rates (typically 2a��3A�/min – due to much heavier crucible) and unknownA�activation energy, it is necessary to deduct about 75a��100A�A�C from the initial start of the observed exotherm toA�suggestA�a maximum temperature for the material. A much more accurate data set can be obtained from an adiabatic calorimeter, but such a test may take 2a��3 days fromA�ambientA�at a rate of 3A�A�C increment per half hour. The technique is gaining in importance particularly in the field ofA�biochemistry, because it facilitates determination of substrate binding toA�enzymes. The technique is commonly used in the pharmaceutical industry to characterize potential drug candidates. Bozzelli, J. (2010). Heat of Combustion via Calorimetry: Detailed Procedures. Chem 339-Physical Chemistry Lab for Chemical Engineers a��Lab Manual.